At long last – I’m posting my review of the latest Twilight film. And you probably thought I’d decided to just keep my mouth shut on this – HA! New Moon was the best of the books, in my opinion. (I use the term “best” loosely.) So I was looking forward to the screen adaptation. Let me first clarify, lest I be somehow misunderstood, that I am absolutely NOT an advocate of the Twilight books. They’re choc full of blasphemy, undiluted heresy, Mormon theology, and codependency. For further explanation, please see my review of the second book here. That being said, as a small group leader for adolescent girls, I think it’s important to be able to address the lies broadcast in American pop-culture and confront them with Christ-centered Gospel truth. I was pleasantly surprised by the opportunity that the New Moon movie set up to do just that. Needless to say, I was shocked when this conversation didn’t actually occur in the film. Instead, the conversation ends with Bella insisting that because she believes the Cullens have souls and because they are so good, they can’t possibly be damned. Carlisle does not say anything. And I say filthy rags. Isaiah 64:4-6. 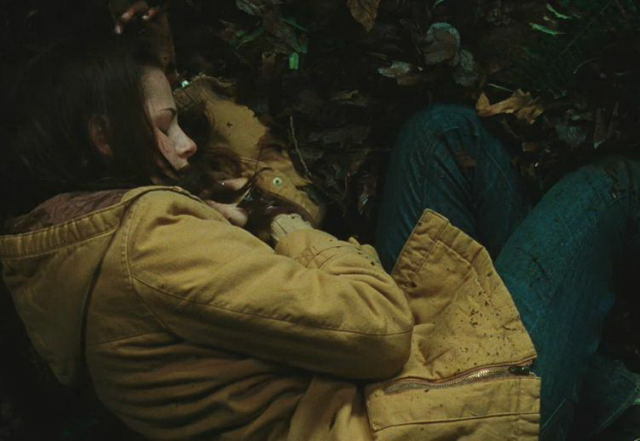 As a result of this incident, Edward and his family take off, leaving Bella behind. He gives two reasons. 1) I don’t want you to come with us. 2) You’re not good for me. Bella’s interpretation: 1) You don’t want me. 2) I’m not good enough for you. Ouch. For every girl in the world who’s ever felt that way before/during/after a relationship, I say “ouch”. So he asks one promise of her, “Don’t do anything reckless,” and then leaves her in the cold. What follows is a beautiful (and tragic) montage of the aftermath. After spending months in a near catatonic state, Bella’s father threatens to have her relocated or hospitalized if she doesn’t get it together. Her solution? Make an attempt to reconnect with old friends. In the process, she discovers that dangerous activities which break her last promise to Edward trigger hallucinations of him warning her to be careful. Driven by a need to see him, she becomes more and more reckless to get her fix. Even cliff diving on a stormy day at high tide into ice-cold water. She reconnects with her childhood friend Jacob Black, a Quileute Native American boy whose father is best friends with her own. They grow close and Bella finds in him a new partner in codependency, though their relationship is strictly platonic, at least for Bella. Still, it’s a far healthier relationship all around and Jacob is steadfast and faithful in his love for her, willing to endure whatever he must to be a part of her life. Oh, and did I mention he’s a werewolf? Yeah, they didn’t make a big deal of that whole process in the film either. But alas – just as Bella is on the brink of letting go of the life she once knew with Edward and move on to a happier, healthier life with Jacob – tragedy strikes. Alice Cullen, Edward’s sister and Bella’s best friend, who has visions of the future – entirely subject to the decisions people make, according to the book (HERESY!) – sees Bella jump off the cliff and assumes it was suicide. She rushes back to WA to confirm the news and console Bella’s family – and finds Bella alive! Edward hears of the death of his star-cross’d love and decides to follow suit the only way he can: to go to Italy and provoke the vampire royalty to execute him. 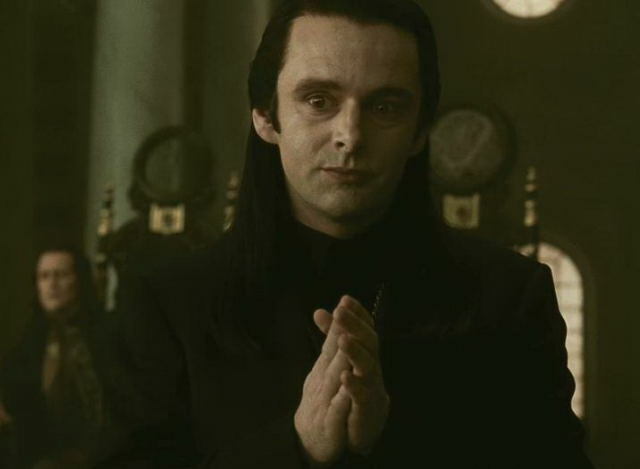 The Volturi are vigilant law-keepers and execution is the only punishment for miscreants. Guided by Alice’s visions, Bella leaves Jacob high and dry and the girls rush off to Italy to try and save Edward’s life. They do, but not before escaping the clutches of the power-hungry Volturi, who are definitely NOT vegetarian vampires, a fact easily discernible by their blood red eyes. The allegory doesn’t line up perfectly, it doesn’t even line up well. But the imagery was strong enough to strike me. I walked into that movie theatre praying that the Lord would give me something I could use to illustrate the Gospel. And looking at Edward, head hung in shame, knowing that everything the accuser is saying is true, anticipating his death and condemnation for eternity in hell – I see myself and my sin. And but for the grace of God and the work of Jesus Christ on the cross, calling me as his own and adopting me as his child, I would be facing the same fate as Edward and the rest of the world who does not know Christ as Lord. That’s my best stab at redeeming Twilight. After reading the books and watching the movies, I honestly can’t understand what so many Christian women love about them. Can you? Two reasons people are in love with them, 1) The power of the Blood, and 2) The quest for eternal life! BAM!